The Primera LX810 has been discontinued. No direct replacement is available. 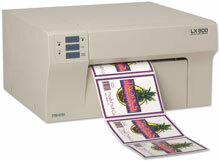 Print full-color labels at up to 4800 dpi! The Primera LX810 prints color labels at an amazing 4800 dpi! 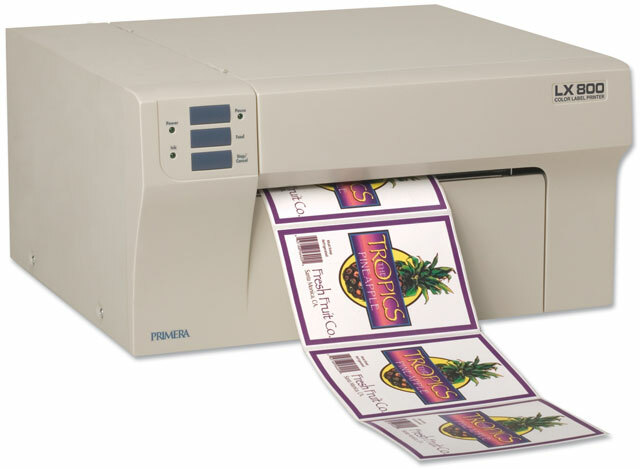 The LX810 is perfect for printing full-color photos, illustrations, graphics and text along with barcodes on product labels, display labels, inventory tags and more. The LX810 can handle labels between 0.75" and 8.25" wide and up to 24" long. The LX810 features inkjet printing at 2"/second for black and 1.5"/second in color and comes with a USB 2.0 interface standard. Both pigment-based (for printing on virtually all gloss and semi-gloss label and tag stocks) and dye-based (for improved barcode printing and water/UV resistance) ink cartridges are supported. The Primera LX810 also comes with NiceLabel design software and Windows drivers. USB 2.0 interface and cable, dye-based black and color ink cartridges, 6"x4" high-gloss label stock starter roll, NiceLabel design software, drivers CD and 100-240 VAC power supply with US plug. USB 2.0 interface and cable, dye-based black and color ink cartridges, 6"x4" high-gloss label stock starter roll, NiceLabel design software, drivers CD and 100-240 VAC power supply with European plug. 3" x 5" High Gloss Label, 500 labels/roll. Single roll.